Graphene 3D Lab announced that it has launched commercial sales of its conductive graphene filament for 3D printing. The filament incorporates highly conductive proprietary nanocarbon materials to enhance the properties of PLA, a widely used thermoplastic material for 3D printing. The filament is therefore compatible with most commercially available 3D printers. The conductive filament can be used to print conductive traces (similar to as used in circuit boards) within 3D printed parts for electronics. 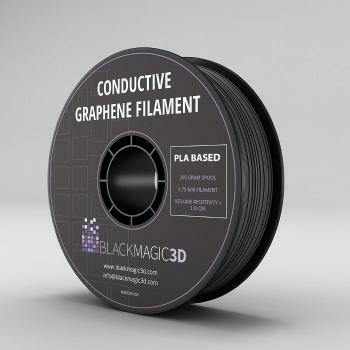 The company's conductive filament is to be distributed through the Company's recently launched brand and e-commerce platform, Black Magic 3D, established as the trade name for all current and future Graphene 3D filaments. The company states that this is an important milestone, achieving revenue through the commercialization of functional 3D printing materials and in achieving its goal of building an ecosystem for 3D printing operational devices.